Update your Google Map to the latest version. It will show it is downloading and then a black square border will appear showing the area that is saved to your device. It should still show your map with both data and Wifi turned off! Sadly it only downloads basic road maps, so no satellite maps available (but its a fantastic start!) Lets hope this trend moves onto the other mapping services such as the excellent educational sources provided by Edina. 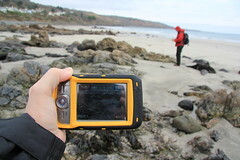 This could really help education for many science and technology based fieldwork locations here at Plymouth University! Google if you're listening, the ability to download satellite maps or even to use my maps (my spaces) with way-points etc included would be fantastic! 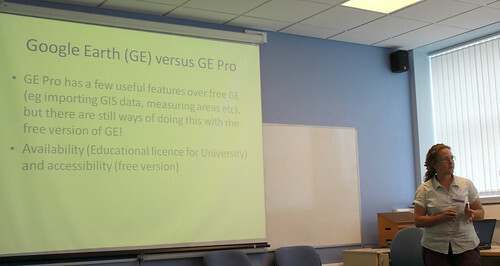 Richard Hartley (Geography, SoGEES) Hardware and software available for collecting and manipulating Geospatial data in Geography. A very large array of topics. I'm always amazed how all these areas overlap in terms of how they recorded and publish data. Of course, from a learning technologist perspective I was rather keen to see how staff used their geospacial resources for teaching, meetings like this are invaluable for getting an idea of what your clients may ask you in the future! Keith Westhead briefly introduced the very handy and excellent iGeology mobile application that is available for both iPhone/Pad and Android devices. This software relies on pulling down their geological map via a 3G data connection or similar in relation to the GPS location provided by the mobile device. As long as you have a fast data connection it works brilliantly. Having had some difficulty using any data derived mapping system such as this in 'very' remote locations, I asked if they were planning to make cached or small maps tiles available to download for use offline (contained within the programme, to ensure copyright issues). Apparently they have not, but he said that this was a good idea and would take this back to BGS and the software developers as a possible feature. I hope that they do! there is a lot of scope for such functionality in fieldwork. Digimap aside, the availability of 'digital maps for mobile devices' (in education contexts) could be an option, so educational software developers can incorporate these maps into their own digital training material. Ideas like these are out of our hands but hopefully organisations such as BGS will consider the wider marketing advantage and offer such services. Cdr Andy Swains presentation, on the Royal Naval approach to using hydrographic mapping and land surveying was very interesting (we are talking life and death situations! The data has to be good! ), its fascinating how different organisations utilise technologies for their benefit. A great set of talks from everyone, I will certainly be looking forward to the next meeting. VC Conference 2011, a set on Flickr. Following on from the TEL showcase day, was the VC's conference, this was again a display of what Plymouth University had to offer in respect to Teaching and Learning, of course there was a little TEL thrown into the mix. This was very much reflected in the Teaching Fellowships awarded and prevalent in the many sessions sharing and discussing Open Educational Resources. These are just a few photographs that capture the day. TEL Showcase 2011, a set on Flickr. The technology enhanced learning team again ran another successful show and 'TEL' (as Dr Neil Witt puts it) of all the exciting things being done using technology to enhance learning. Practitioners and developers alike all showed there wares, with 3 paralleled sessions with workshops running throughout the day. Plymouth is certainly becoming a very creative hotspot for TEL development.